She was the woman in an iconic photograph shown kissing an ecstatic sailor in Times Square celebrating the end of World War II. Greta Zimmer Friedman fled Austria during the war. She was a 21-year-old dental assistant when she became part of one of the most memorable moments of the 20th Century. August 14th, known as V-J Day when Japan surrendered to the United States, people spilled into the New York City streets from restaurants, bars, and movie theaters, and began celebrating the news. That’s when George Mendonsa spotted Friedman, spun her around, and planted a kiss. The two had never met. In fact, Mendonsa was on a date with a hospital nurse, Rita Petry, who would later become his wife. 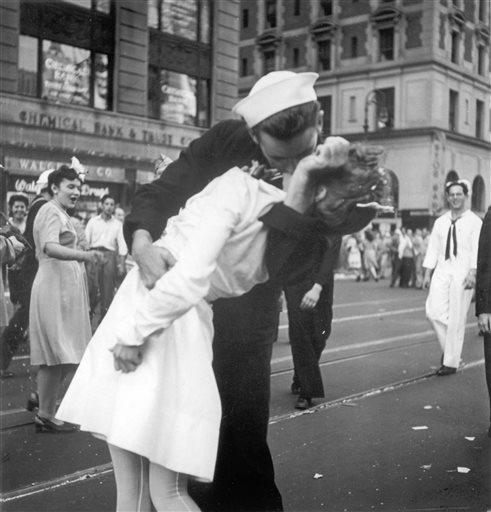 The photo by Alfred Eisenstaedt was titled V-J Day in Times Square, but is known to most simply as The Kiss. In some photos of the scene, Petry could be seen smiling in the background. It was first published in Life Magazine, buried deep within its pages. Over the years, the photo gained recognition, and several people claimed to be the kissing couple. In an August 1980 issue of Life, Eleven men and three women said they were the subjects. It was years before Mendonsa and Friedman were confirmed to be the couple. Greta recalled the events happening in an instant. She never thought it was much of a kiss or some kind of romantic event. Both of Friedman’s parents died in The Holocaust. She will be buried in Arlington National Cemetery, next to her late husband. Greta Zimmer Friedman was 92. This entry was posted on Sunday, September 11th, 2016 at 1:29 am	and is filed under Blog by Manny Pacheco. You can follow any comments to this post through the RSS 2.0 feed. Responses are currently closed, but you can trackback from your own site.